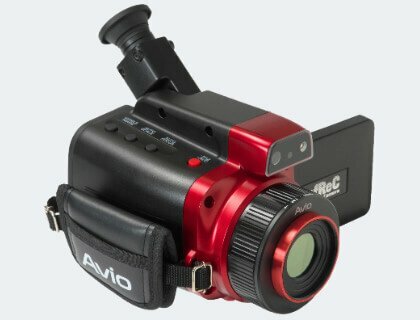 The AVIO R550 series features high speed sampling - up to 120Hz (R550Pro model) - the highest speed sampling in the portable VGA class equipment (as of August 2018), a high resolution 1.2MP SR Thermal Image (1280 x 960 pixels) and automatic recording functions. 2 models available depending on your application. The AVIO R550Pro with a temperature range of -40 to +2000°C makes this model ideal for R&D, whilst the R550 with a temperature range of -40 to +650°C is ideal for electrical inspection applications. Standard Accessories Wired Remote Controller x 1, SD Card x 1, USB Cable x 1, Neck Strap x 1, Grip Belt x 1, Rechargeable Li-Ion Battery x 1, Software x 1, Operation Manual x 1, and Carrying Case x 1. *5 This increased resolution results from detecting characteristic within all frames acquired by the SR process and removing such effects as those caused by hand vibration. 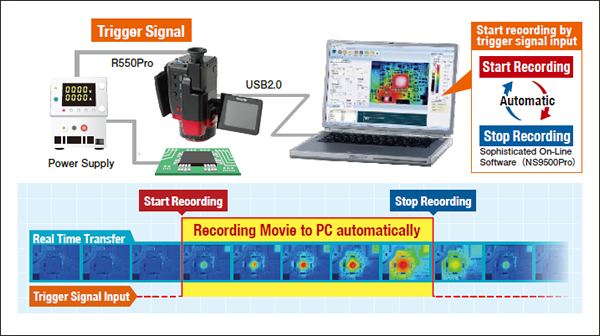 *7 Thermal image only when image transfer speed at 30Hz. 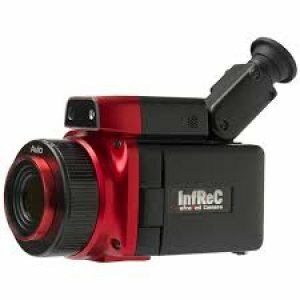 *8 In order to transfer Thermal image movie data by R550 / R550-D, you need to upgrade to "InfReC Analyzer NS9500 Professional" (optional software).